What is the perfect murder? Hitchcock seemingly toys with this question in Rope . Starring Jimmy Stewart, Farley Granger, and John Dall, the latter two are students who murder their peer from university. Their only reason for doing it however is to see if they can get away with the crime. To complete their little experiment, they invite the boy’s family, his girlfriend, and other guests over to dinner, right in the room where they committed the murder. As an after though they invite their former professor (Stewart) who is the only one who would be able to catch them. At first Stewart does not suspect anything but eventually he becomes suspicious without letting on. Finally, the students lose their cool and Stewart catches them red-handed. This quickly puts an end to the perfect crime. This film is interesting because it was made to look like it was shot on one reel. 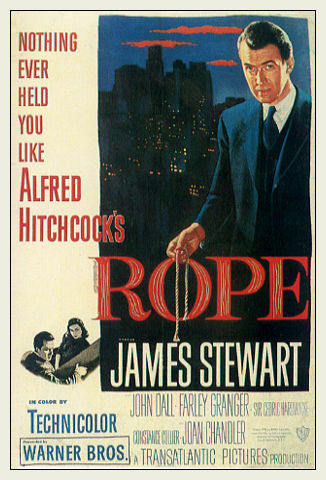 Hitchcock’s movies are often known for the editing and yet this film was shot almost like a play in very long takes. This entry was posted in 1940s, Mystery, Thriller and tagged Alfred Hitchcock, Farley Granger, James Stewart, John Dall by 4StarFilmFan. Bookmark the permalink.